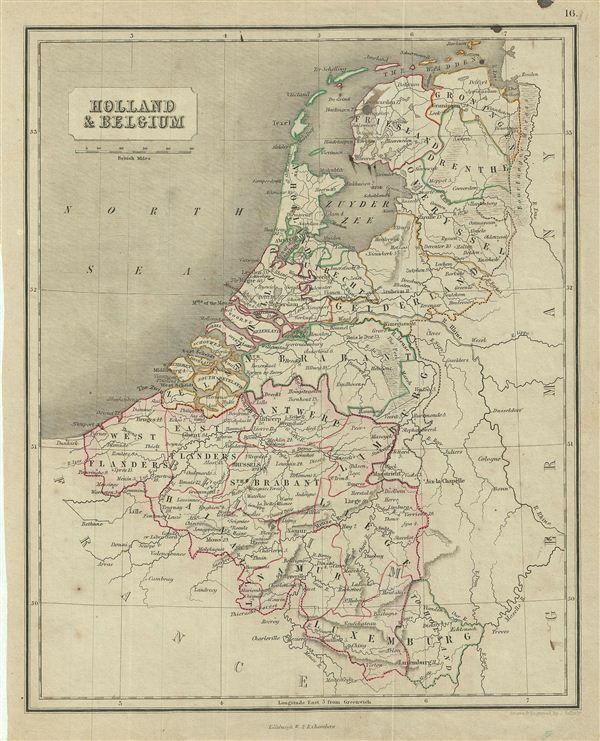 This is a fine example of the 1845 Chambers map of Holland (The Netherlands) and Belgium. The map covers the United Kingdom of Netherlands including Holland and Belgium from the North Sea to the Duchy of Luxembourg. In 1830, the Belgian Revolution led to the secession of Belgium from the United Kingdom of Netherlands and the establishment of the independent Kingdom of Belgium. Though Belgium had successfully made itself independent, the Netherlands refused to recognize the new country until the 1839 Treaty of London. Divided and color coded according to regions and territories, the map identifies various cities, towns, islands, rivers, and an assortment of additional topographical details. This map was drawn and engraved by J. Gellatly. William Chambers (April 16, 1800 - May 20, 1883) and Robert Chambers (July 10, 1802 - March 17, 1871) were born into a prosperous family on the border between Scotland and England. Unfortunately, by puberty their family fortunes had declined due to their father's bad loans to French prisoners of war. Left with little Robert Chambers, then 16, opened a small bookstand on Leith Walk, Edinburgh. His brother William, at 18, opened a bookstand of his own on the same street. A short time afterwards the two joined forces. Due to their thrifty business practices and hard work, the duo quickly developed a thriving business and began publishing. Their first publishing venture was 750 copies of "The Songs of Robert Burns", a sure bet in 19th century Edinburgh. They followed up with a series of educational works including several atlases, an encyclopedia, and more Burns books. The firm continued to publish into the early 20th century. Very good. Moderate age toning. Blank on verso. Minor stains over Friesland and the top margin.